Northwest of Madrid (three hours by train), Salamanca is youthful and untouristy, displaying its mighty monuments, clusters of cloisters, and magnificent square with quiet pride. Carlos and I sat down at a table with a prime view of the square and all its people action. Carlos ordered us a simple but elegant meal: a plate of cured ham, patatas bravas (chunks of potatoes with tomato sauce) and glasses of robust local red wine. When the ham arrived, he told of his grandpa thinly carving a jamón, supported in a jamonero (ham holder) during Christmas, painting a holiday image that reminded me of my dad carving the turkey at Thanksgiving. Our view was filled with people. 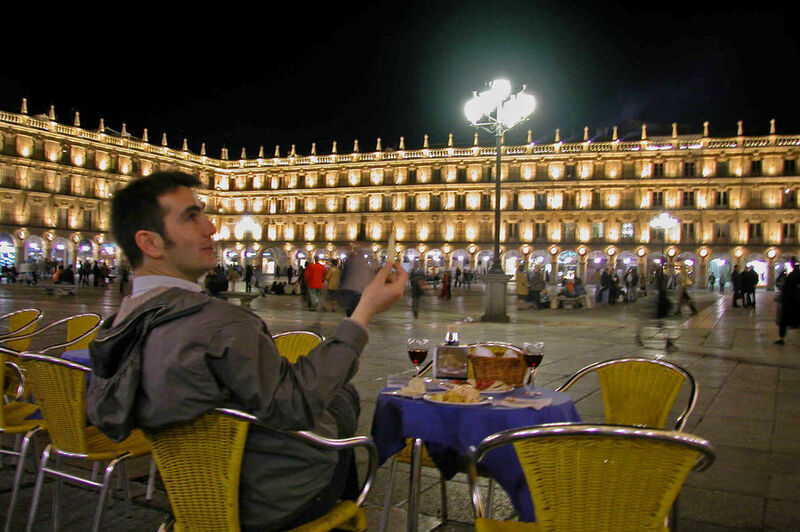 Plaza Mayor has long been Salamanca’s community living room. The most important place in town, it seems to be continually hosting some kind of party. Spaniards love their paseo (evening stroll) — it’s like multi-generational “cruising” without cars. While the old-timers gossiped and “tsk-tsked” at the promiscuous young people, those young singles were out to see and be seen. Carlos explained that historically, the square is a big viewing arena where the men circulate one way and the women circle the other so everyone gets a chance to check everyone out. Flirting rages as the boys are on a quest for the perfect queso (cheese), meaning a cute dish. Perhaps the best time of all for people-watching is Sunday after Mass, when the grandmothers gather here in their Sunday best. The Plaza Mayor is just the starting point for a Salamanca visit. Salamanca's University, the oldest in Spain (1230), was one of Europe’s leading centers of learning for 400 years. Columbus came here for travel tips. Today many Americans enjoy its excellent summer program. The old lecture halls around the central cloister, where many of Spain's Golden Age heroes studied, are open to the public. Some of the rooms are still used by the university for prestigious academic ceremonies. The entrance portal of the university is a great example of Spain’s Plateresque style (Spain’s version of Flamboyant Gothic) — the style named for masonry so intricate it looks like silverwork. Near the university stands the Church of San Esteban, dedicated to St. Stephen (Esteban) the martyr. The church contains impressive cloisters, a pantheon of tombs, and a museum with illustrated 16th-century choir books. But everything is overwhelmed by the church’s Churriguera altarpiece, a textbook example of the style named after the artist. Quietly ponder the gold-plated cottage cheese as tourists shake their heads and say “too much” in their mother tongue. Salamanca’s many students help keep prices down. The young people congregate under the stars until late in the night, chanting and cheering, talking and singing. Over the centuries, the university’s poorer students earned money to fund their education by singing in Salamanca’s streets: a tradition called “tuna music.” The name tuna, which has nothing to do with fish, refers to a vagabond student lifesyle and later was applied to the music these students sing. This 15th- to 18th-century tradition survives today as groups of students, dressed in the traditional black capes and leggings, sing and play mandolins and guitars, serenading the public in the bars on and around the Plaza Mayor. While they make their serious money performing for weddings on weekends, you’re likely to see them out singing for tips on summer week nights. For a fun meal, do the tapa tango. Salamanca bars offer a great selection of tapas, featuring a tasty variety of treats — seafood, salads, meat-filled pastries, deep-fried goodies, and on and on. Wash down your tapa with iced gazpacho (spicy tomato soup), a cool treat on a hot day. 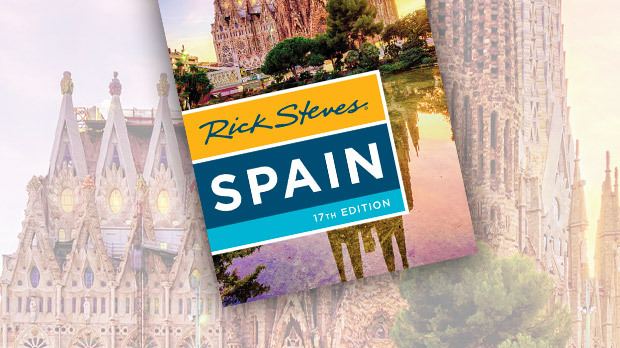 Don’t miss the charms of the sunny sandstone city of Salamanca — with Spain’s grandest plaza, its oldest university, and a fascinating history all swaddled in an affordable and fun-loving college-town ambience.